This past week has been a novelty in my family history search. The question was “How are we related? We must be related!” I remember that as a child, my parents and I would often would get together with Donny and his parents. I believe that they lived in the Grand Rapids and had a lake cottage to the north of Muskegon. I also remember that Donny was a red-head. I do not remember when those visits ended nor why they ended. Last week, I received a memo through Ancestry.com from Donny. I suspect that it was our the first contact in nearly a half-century! He had seen my family tree online and now had questions for me. Since that first memo, we have now exchanged nearly a dozen more. Now known as Don, he believes our link to be back with the marriage of Johann William Abel to his second wife, Anna Lutje Kramer; he believes the link to be with Anna. I stumble with the fact that those two ancestors were both German while Don’s ancestry is long with Irish roots. We both are able to recall the same names and places and they all seem to revolve around Anna and her ancestry…which is a foggy one to me, at best! Anna with youngest son, Frederick. Anna Lutje Kramer has been a bit difficult for me to understand. I know that in the summer of 1871, she married a German immigrant, Johann Kramer in Grand Haven and that her sister, Metta married another German immigrant, Louis Bredehoft, in Grand Haven just two years prior. Bredehoft immigrated in 1866. I believe that they came to the USA from NW Germany, the area of Heinbockel, Hanover. It is a mystery as to how or why they ended up in Ottawa County. Anna’s husband, Kramer died within months of their marriage. Family history states that her German-speaking minister introduced her to a widower with two small children, living several miles to the east in Blendon Township. Johann Abel’s wife, Ida Steinschen died in early December 1875. Within six months of their meeting, the two were wed by the Rev. Henry Bauer, and within another ten months Anna gave birth to her first child and Johann’s fourth child. 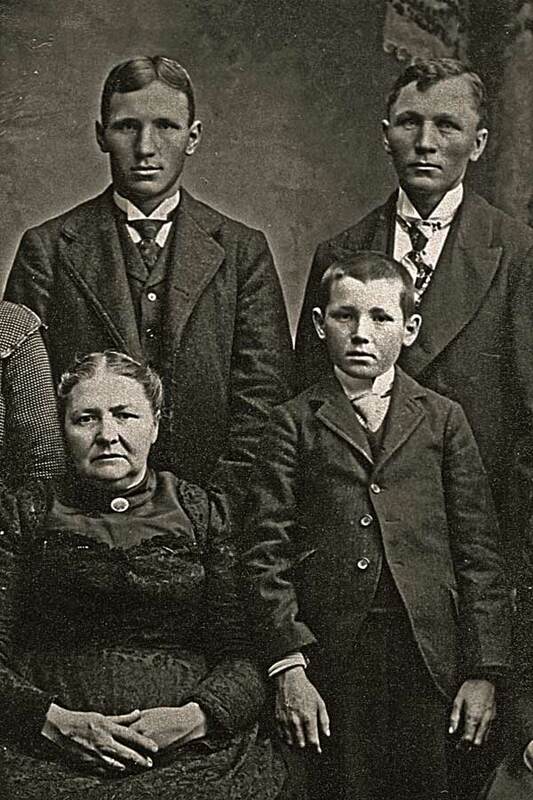 Over the course of their 34-year marriage, Anna gave birth to nine children and raised all eleven on their farm near Beaverdam in Ottawa County, Michigan. Now the work continues! Don and I are planning to meet this summer and go through all of our facts. Hopefully, we will be able to answer that big question…are you my cousin?